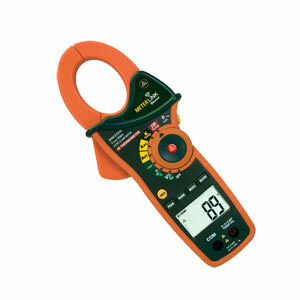 The HHM-EX845 is a CAT IV True RMS 1000A Clamp Meter. This meter is supplied in the Meterlink kit and includes a Bluetooth® module designed for use with the OSXL-T620 (FLIR T620) thermal imaging cameras. The combination of a clamp meter and an infrared camera is used for electrical power measurement, analysis and documentation. The HHM-EX845 measurement functions include AC/DC voltage, AC/DC current, resistance, capacitance, frequency, duty cycle, diode test, continuity, Type K thermocouple thermometer plus non-contact infrared temperature. Nota: Comes complete with CAT IV test leads, 9V battery, Type K probe, pouch case and operator’s manual.